This is a classic item that goes very well with rapid fire humorous patter. In effect, the performer shows two large sticks. Each stick has got a through and through hole at one end; through this hole is running a string. One end of each string terminates into a plastic bead, while at the other end is fixed a red tassel. Both the sticks are also hollow. 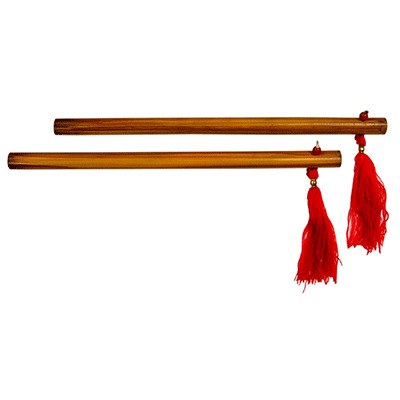 At the beginning one string is inside the stick, tassel appears close to the hole. Other string with tassel is running outside the stick. 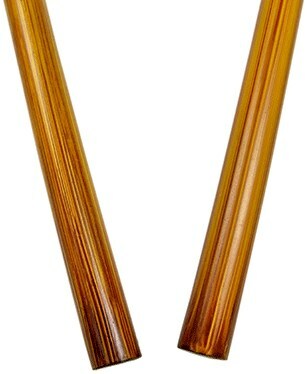 Holding two sticks at v-shape in his hand as the performer pulls the tassel appearing close to the hole of a stick outward, tassel fixed to the other string is pulled back towards the hole inside the second stick and this business is alternatively repeated causing fun to the audience. Finally holding the two sticks separately performer repeats above business several times, proving that there is no link between two strings and that causes great surprise to the audience. This classic of magic has never looked better. Especially for the price! These sticks are just beautiful and handle the same as more expensive models. Dark red cord with gold accents make these sticks look great either in a parlor situation or on stage.